Tarsiers, considered as the mascot for Bohol is now like signature shirts displayed in places visited by tourists. This, after the Department of Environment and Natural Resources (DENR) reportedly gave new permitees the right to bring tarsiers in their areas of business. Coupled with this setback of DENR's role as supposed protector of these tarsiers is the lack of inventory of tarsiers up to this day. A survey conducted yesterday by dyRD's "Radyo Merkado," a weekly public affairs program, registered a resounding call for government authorities to take drastic action on how to preserve these tarsiers. The public clamor to conserve the tarsier came after reports surfaced that new tarsier display areas were recently issued permits by DENR. These are in Loay, Panglao, Sagbayan and Albur towns. PENRO Nestor Canda confirmed to the Chronicle that new permits were issued by the regional DENR offices without passing through the local DENR. Respondents of the survey expressed concern on the life span of the tarsiers, considered endangered, if no inventories be made especially that they are being "commercialized" at the various display centers. "One day Boholanos will wake up with no more tarsiers to be part of the tourism jewel of the province," most of the respondents said. The radio program was jammed with calls and text messages expressing concern for the preservation of tarsiers, citing that the natural habitat in Corella should be enhanced in order to project that indeed these tarsiers are being "taken care by the Boholanos." Presently, most tourists will get to see the tarsiers after taking their lunch at the Loboc River floating restaurants. It maybe noted that complaints were recently received regarding the imposition of P50 to view tarsiers in Loboc town. With this recent development on new issuance of permits by DENR, the Tarsier Foundation, Inc. based in Corella town is contemplating for its possible closure if government will fail in its role to protect the tarsiers. animals to be brought to other towns. crawling animals on trunk of trees. The Philippine tarsier looks so cute and cuddly, many people would like to keep it as a pet. In a cage, however, the tarsier has only a slim chance of surviving, according to Corazon Catibog-Sinha, Assistant Director of the Protected Areas and Wildlife Bureau (PAWB), a line agency of the Department of Environment and Natural Resources (DENR). "In captivity, the tarsier can be so extremely distressed it may die of psychological trauma," explains Dr. Catibog-Sinha. In the wilds, a tarsier is expected to live up to 24 years. In captivity, however, a tarsier's life expectancy is a little more than 12 years. Many tarsiers seized from the wilds and placed in captivity survive only for two to five years. Some tarsiers captured and placed in enclosures have even been reported to commit suicide by smashing their heads against objects. Hunted down to be sold as pets in Metro Manila, the tarsier has become an endangered species. The dwindling number of tarsier in the country has also been traced to the rapid destruction of their known forest habitats. Most of the Philippine tarsiers are found in Bohol, Southern Philippines. In the 1960's tarsiers were a common sight on the highway that cuts through the forested hill of Corella town," recalls Mr. Carlito Pizarras. Mr. Pizarras earned the monicker "Tarsier Man" for being the only person who has successfully cared for and bred the Philippine tarsier in captivity. The hunter turned conservationist claims to have succeeded in breeding 20 tarsiers in captivity. "Today, only about 1,000 tarsiers can be found in the wilds of Corella, Bohol," says the gamekeeper of the Philippine Tarsier Foundation Inc. (PTFI). The foundation is based in Tagbilaran City, Bohol. For the past 45 million years, tarsiers have inhabited rainforests around the world, but now they only exist on a few islands in the Philippines, Borneo and Indonesia. In Bohol, the Philippine Tarsier was a common sight in the southern part of the island until the 1960's. Since then, the number has dwindled to as few as an estimated 1000 still left in the wild. Once protected by the humid rainforests and mist-shrouded hills, these mysterious primates struggle to survive as their home is cleared for crop growing. It also runs a Tarsier Research and Development Center, which serves as a visitor center and venue for research, as well as a habitat preserve. At the sanctuary, a spacious net enclosure keeps 100 Philippine Tarsiers for feeding, captive breeding and display. 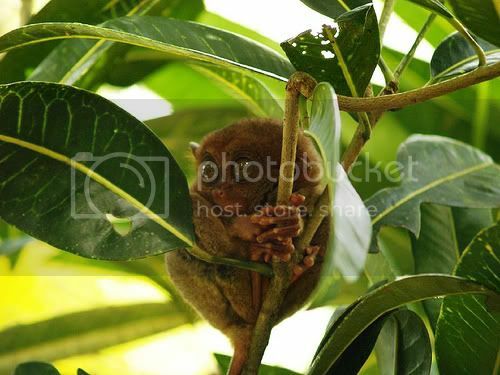 Here, visitors can observe the Philippine Tarsier in their natural habitat. Within the sanctuary, the Philippine Tarsiers roam freely and all of them have got used to a seven-foot high fence that circumscribes the territory and which serves mainly to protect them from predators like feral cats. At night, tarsiers can be seen climbing out of the fence to forage for food farther into the forest. They return again before daybreak, as if observing a curfew. Do not visit the caged Tarsiers which are elsewhere on the island (especially Loboc). These are often stolen from the sanctuary and are so traumatised they can no longer breed. Hi..Not really sure what to do.. We live in Bingag Dauis and this morning have been clearing some very overgrown and dense jungle type land..One of the workers carried over a tarsier he said fell from a small tree he was cutting down..He was amazed at this find as he had never seen one before in his life..Weve put it in a tree near the house awaiting someone from Corella too pick it up.. It has been suggested that it might be an escapee from illegal trade but Im not convinced..We are far from any houses and the highway is 500 meters from our place..It seems quite young and now Im thinking it might have its parents still in there where they found it..I have a feeling there maybe a small colony of them in there..Not sure if its best to just put it back there as it seems really healthy..
BTW..Im a Brit living in Bingag. zeffa...,milayas tingali na siya gikan sa Corella. Puno na man sila didto sa foundation. naa'y usa diri's China...iapil pag ihap..
Hi there..Sorry cannot understand Bisaysa yet very well so not sure what you said..
We have stopped cutting the undergrowth etc and my wife wants me to put it back where it was found..I think I agree with her and will try to do this before nightfall to avoid to much stress in the animal..
Hope this is the right thing to do. bitaw pod no....kay basin ug dili iapil pag ihap kay masaypan nga ilaga'ng pawot.. Unfortunately my camera is not working properly and needs fixing.. I will try to borrow one if I can. Very frustrating!! Hi Zeff. I feel, too, that a young and healthy specimen, under the circumstances, would indicate that there's a colony of tarsiers near your place. Now, that's something! I don't really know much about tarsiers but, yes, they are known to be unable to bear close human contact are are said to be better left pretty much alone. Ok..Sorry couldn't find another camera.. Put it back into its previous habitat so will probably never see it again.. It did bite the handler and he wasn't too pleased but at least that is an indication that it is truly wild..
Amazing creature and much better to seen in its own environment..I never really enjoyed seeing them in cages at Loboc. Sad to see it go..
Has anyone heard that these animals can be found on Panglao island? Locals all say they have never seen one. At this time, did you know that there are more tarsiers in Corella than the people there.? Tinuod na, dili na ma inventory. Daghan na kaajo. Nag migrate na didto sa Sikatuna ug Balilihan. Miabot na diay sa Dauis.